ITHACA, NY: The Cornell University Library announces the publication of A Bend in the Road, a collection of poems by Eamon J. McEneaney, Cornell alumnus and one of the greatest lacrosse players of all time. The publication of this volume is particular poignant, since Eamon McEneaney did not live to see the realization of one of his lifelong dreams. Although he survived the 1993 bombing of the World Trade Center when he led 60 people to safety, he lost his life in the terrorist attacks of September 11th, 2001 while at work on the 105th floor of the North Tower. Eamon McEneaney was loved for his sense of humor, his passion for life, his determination to succeed, and his deep compassion for others in need. After his death, his widow, Bonnie, and one of his closest friends, John Gilbert, were determined that his dream of becoming a published poet would be recognized, and they have tirelessly worked towards this goal. 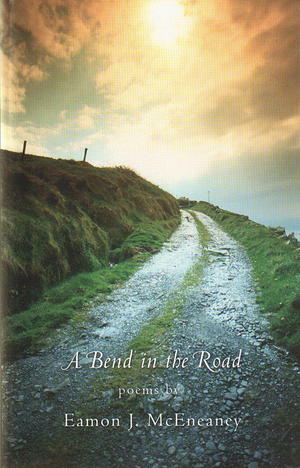 On December 6th, 2004, A Bend in the Road, a collection of Eamon McEneaney's poems will be released. Proceeds from the sale of the book will be used to support the Eamon McEneaney Visiting Irish Writers Series at Cornell and the Cornell University Library.